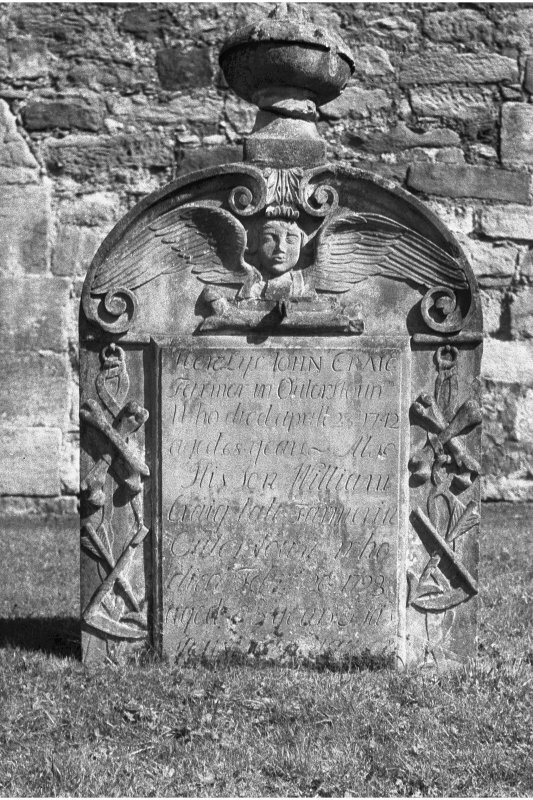 View of reverse face of gravestone for John Craig, d. 1742, in the churchyard of Temple Church. 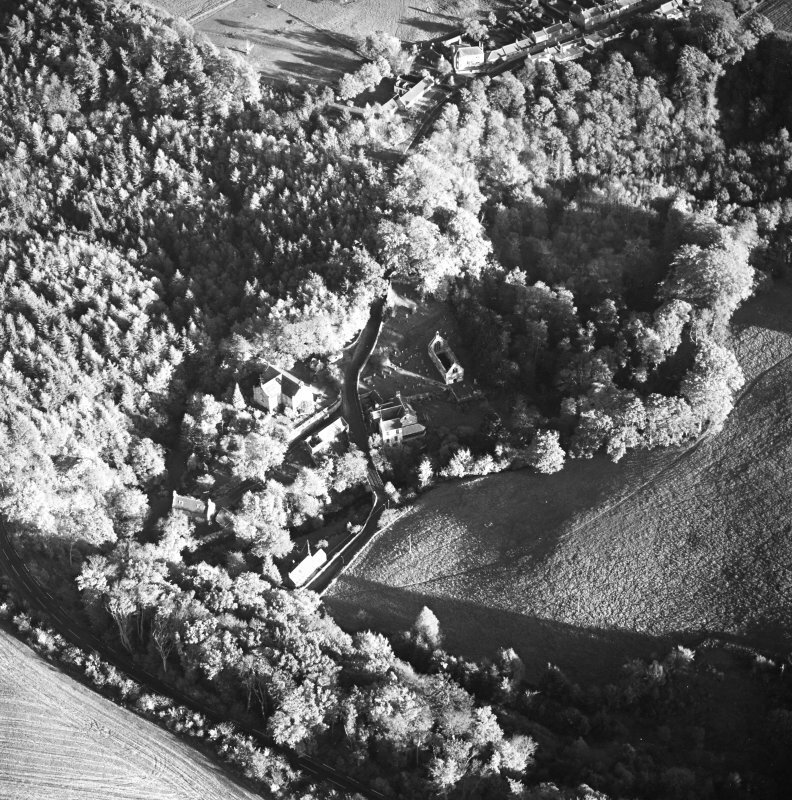 Oblique aerial view of Braidwood centred on linear cropmarks with two churches and a session-house visible in the upper left, taken from the N.
Oblique aerial view of the Temple Parish Church centred on the church with other church, possible building, culvert and other building adjacent, taken from the NW. 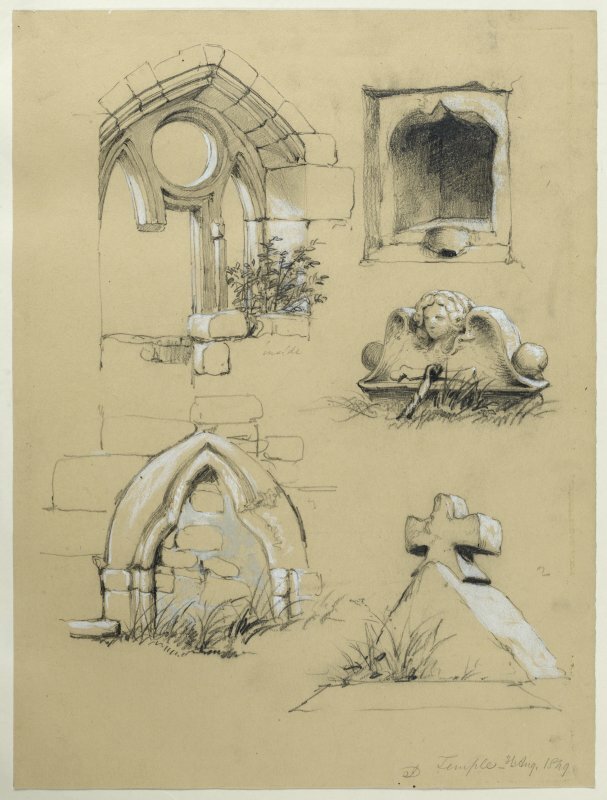 Drawing of windows and gravestones, Temple Church. Drawing showing general view from SE and plan shaded to show dates of construction. 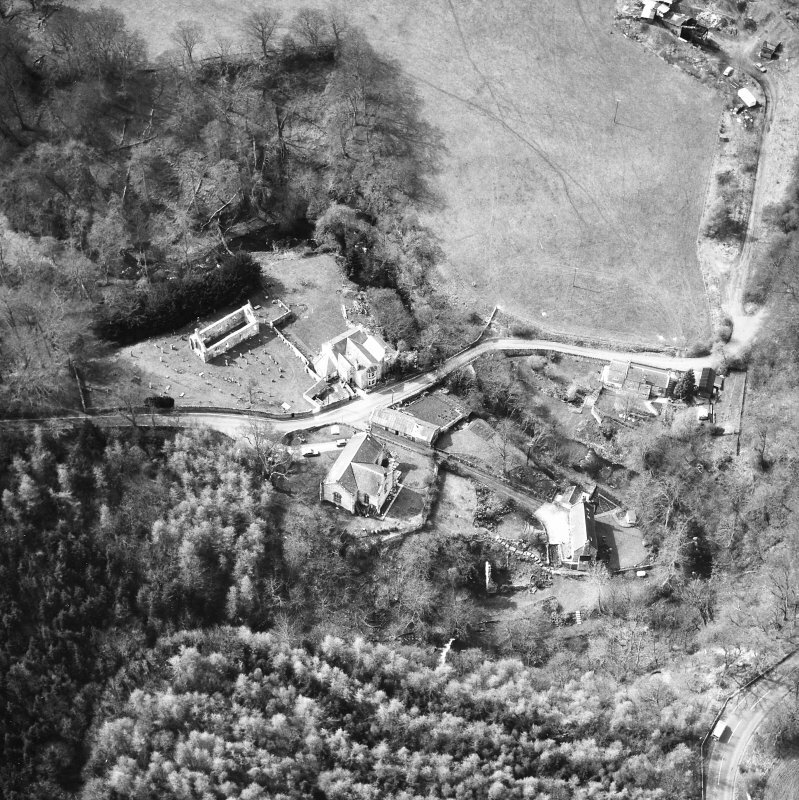 Oblique aerial view of the Temple Parish Church centred on the church with other church, possible building, culvert, and other building adjacent, taken from the W.
Oblique aerial view of Temple Parish Church centred on church with other church, possible building, culvert, and building adjacent, taken from the SW.
View of reverse face of gravestone of John Craig, d. 1742, showing relief portrait with children. 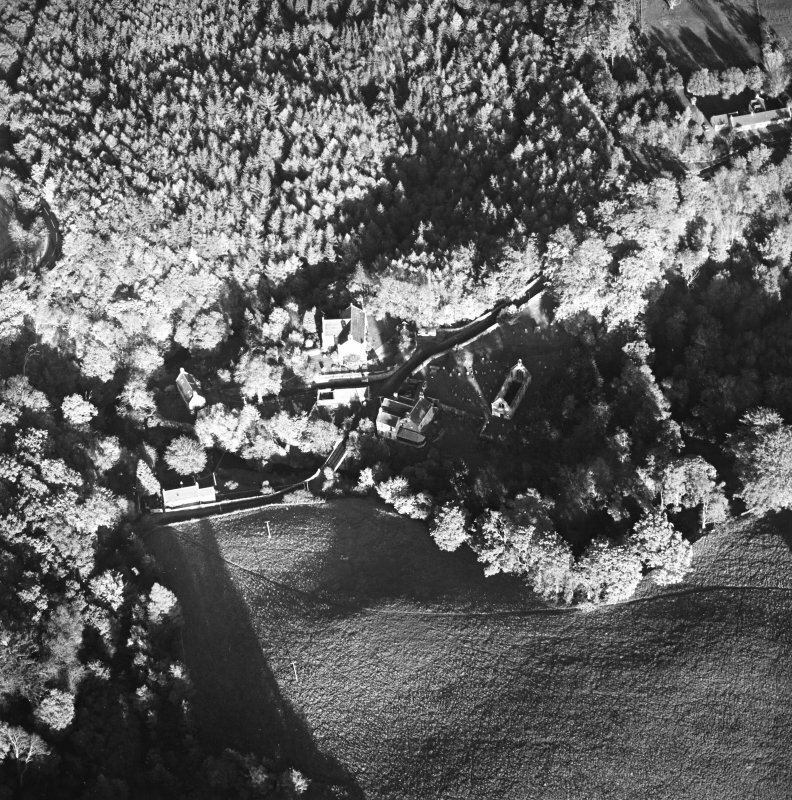 Oblique aerial view of the Temple Parish Church centred on the church with other church, possible building, culvert and other building adjacent, taken from the S.
Oblique aerial view of the Temple Parish Church centred on the church with other church, possible building, culvert and other building adjacent, taken from the SW.
Oblique aerial view of Temple Parish Church centred on church with other church, possible building, culvert, and building adjacent, taken from the NW. View of Temple Church from South-East. 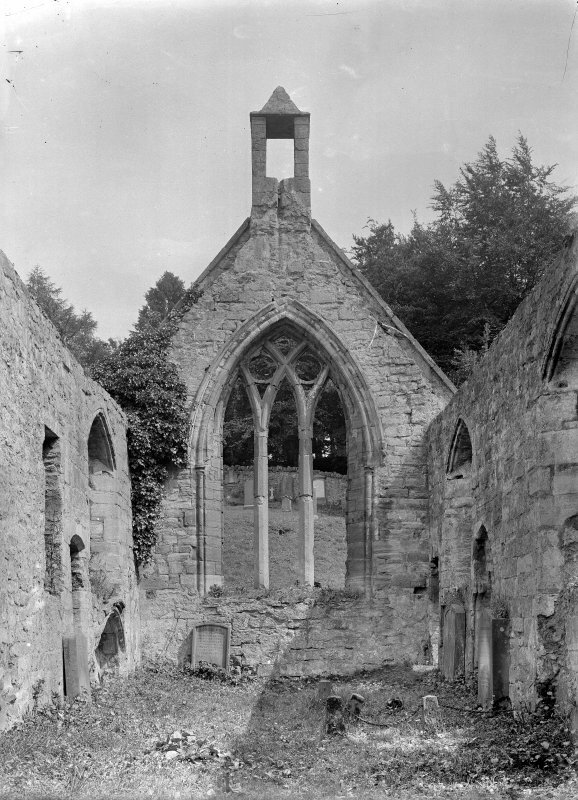 Historic photograph showing general view of ruinous church. 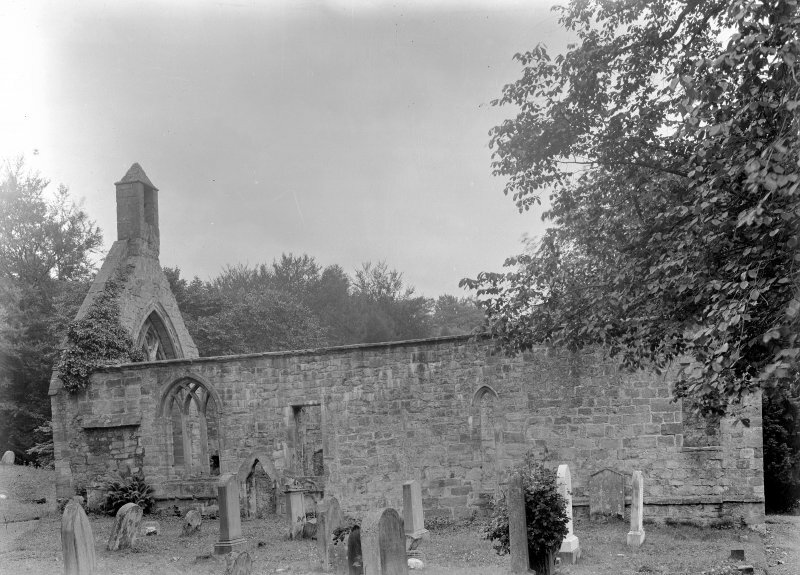 General view of Old Church from NE. 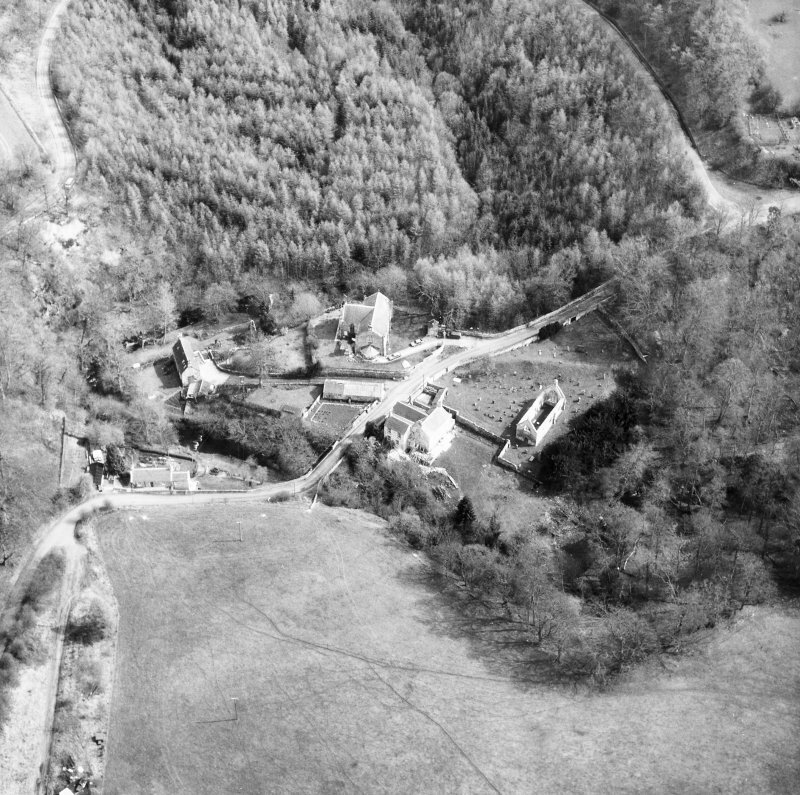 Oblique aerial view of the Temple Parish Church centred on the church with other church, possible building, culvert, and building adjacent, taken from the S.
Interior. 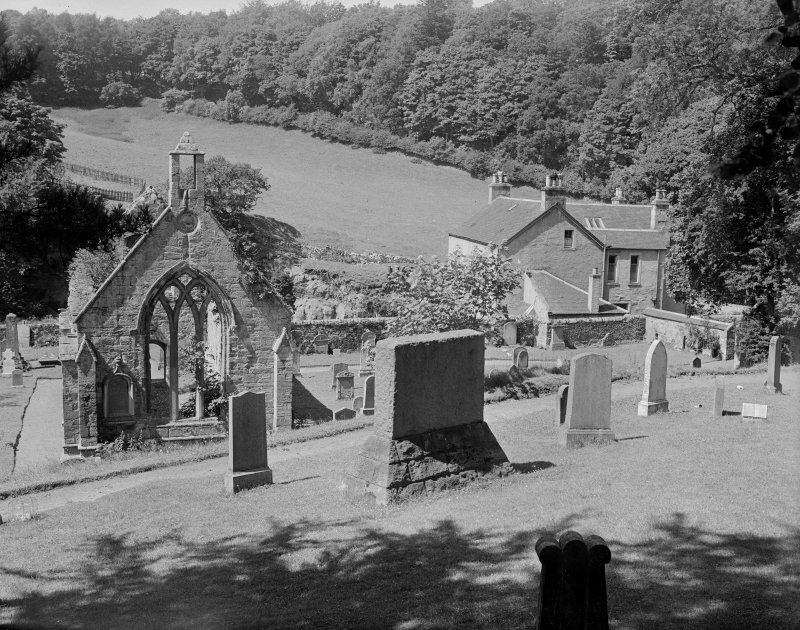 General view from W.
Temple churchyard. 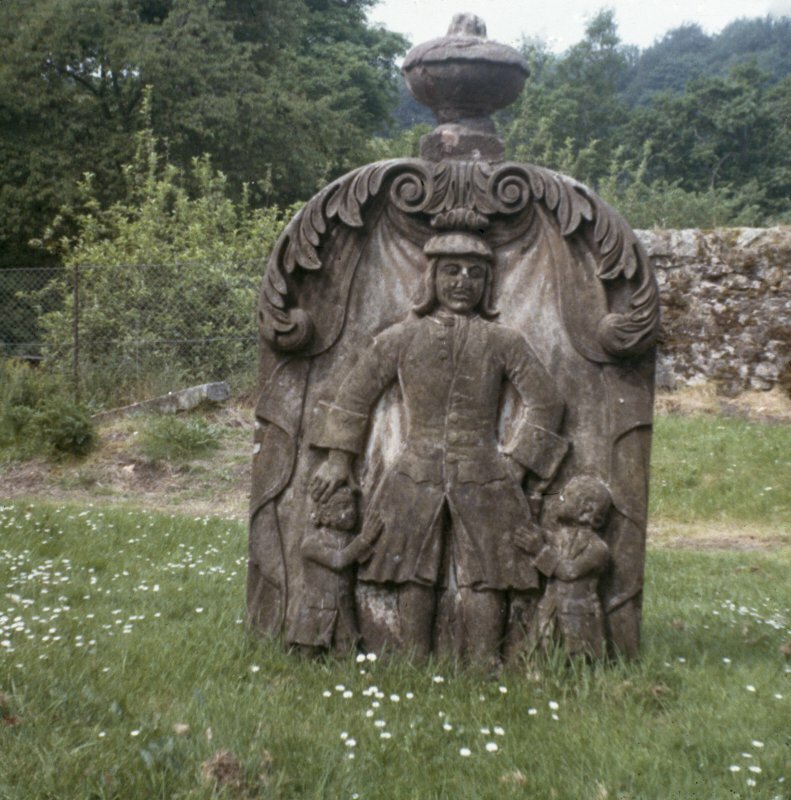 View of gravestone of John Craig, d. 1742. 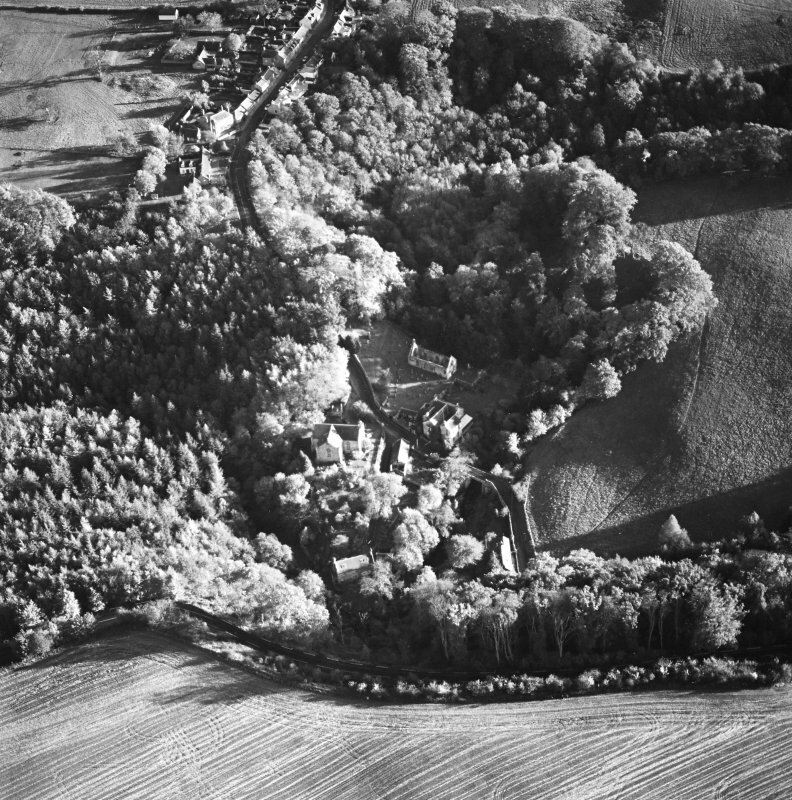 Oblique aerial view of Braidwood centred on linear cropmarks with two churches and a session-house visible in the upper right, taken from the NW. 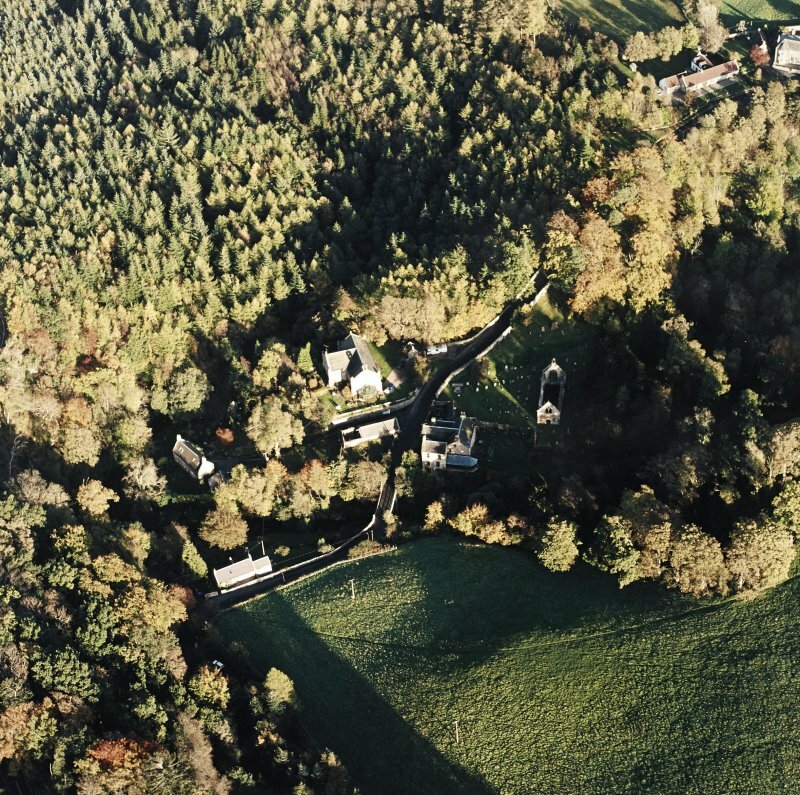 Oblique aerial view of Temple Parish Church centred on church with other church, possible building, culvert, and building adjacent, taken from the W.
General view of Temple Church and cemetery. 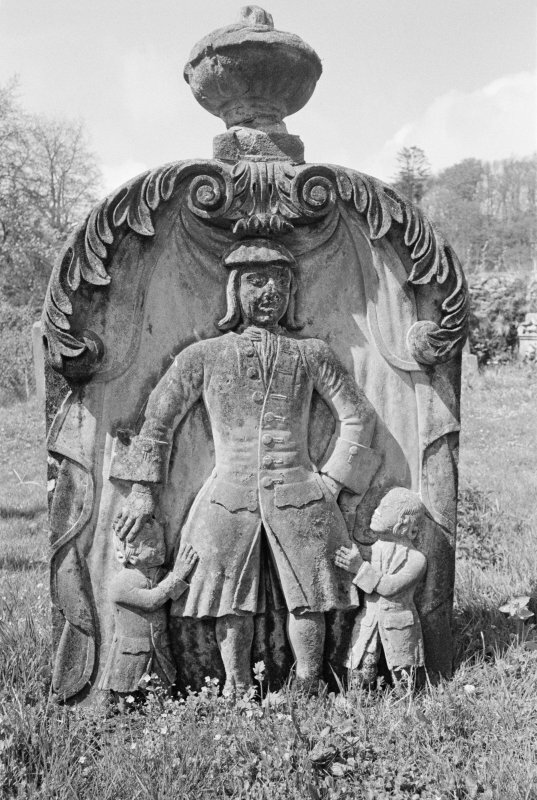 View of gravestone of John Paterson, d. 1751, in the churchyard of Temple Church. 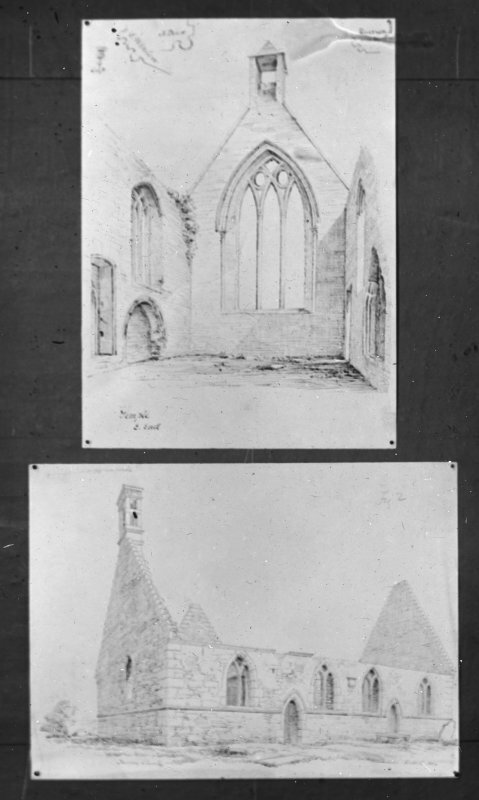 Drawings showing interior of Temple Old Church and general view of Drainie Old Parish Church from SW. 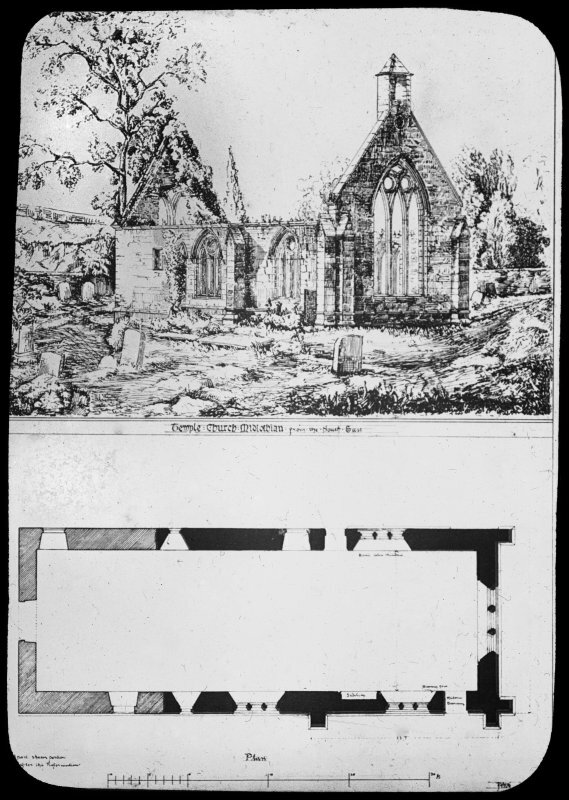 Drawing of general view, Temple Church from SW. 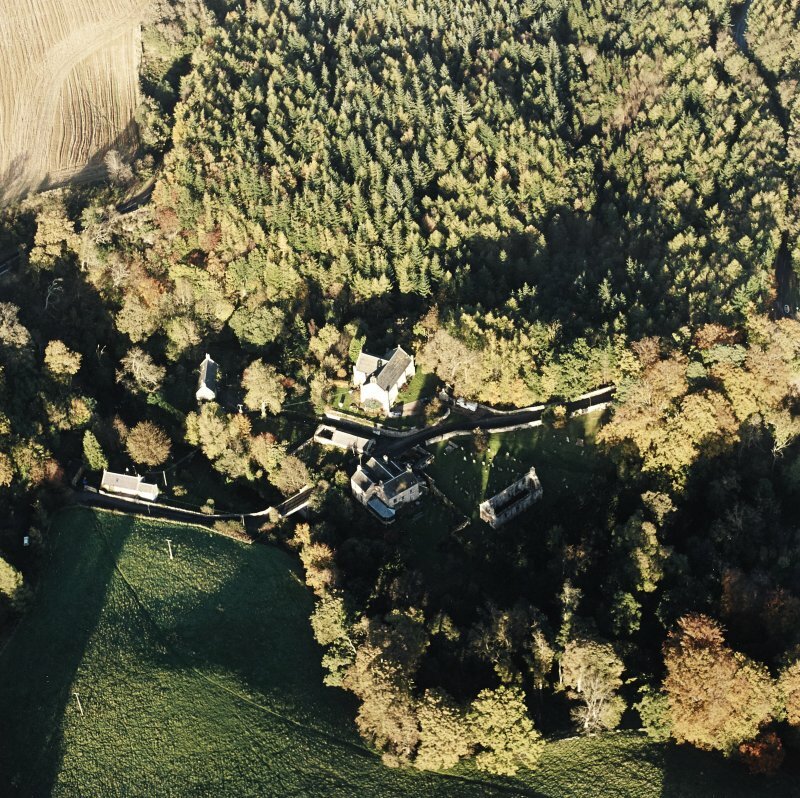 The modern 'Temple' is identical with 'Balantrodoch', the principal seat of the Knights Templars in Scotland. There is no record of its foundation, though it is commonly assumed that this was due to David I. The earliest reference is probably in a charter of 1175-99. 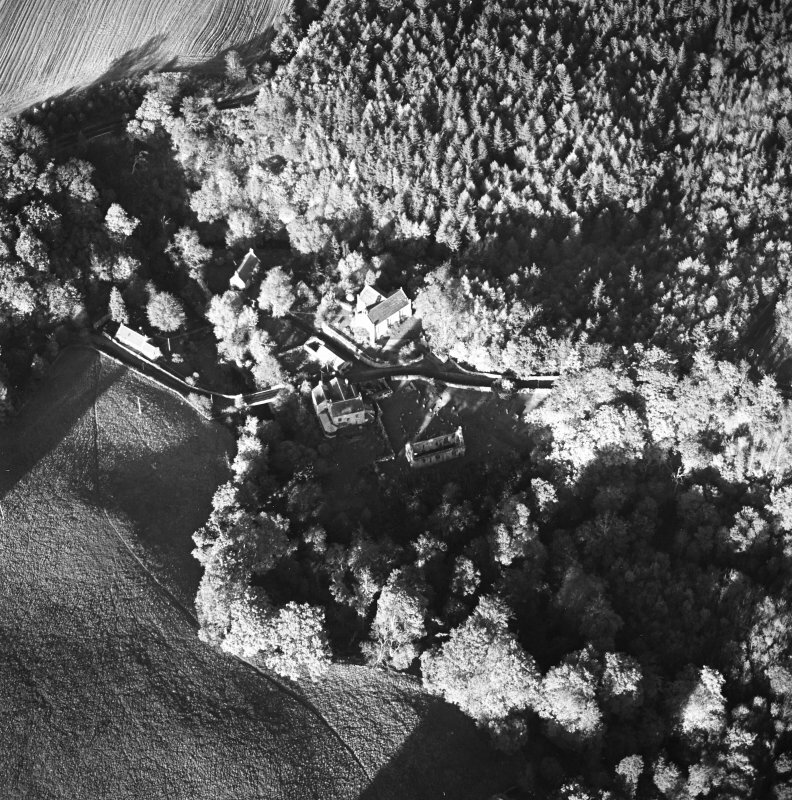 After the suppression of the Templars, about 1309, "Temphill of Balantrodoch with the kirk" became one of the baronies held by the Hospitallers, while, at an unascertained date, the former Templars' church became parochial. 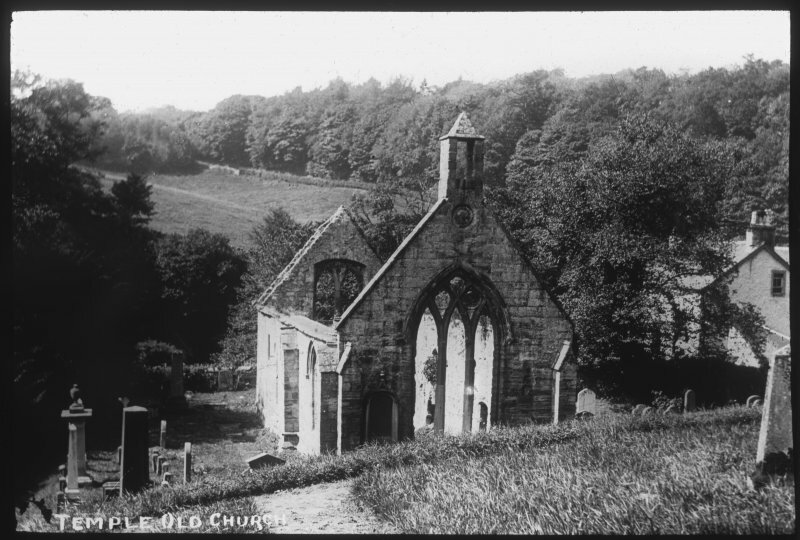 That church was in use until the present church (at NT 3151 5878) was built, in 1832, and still exists in ruins. 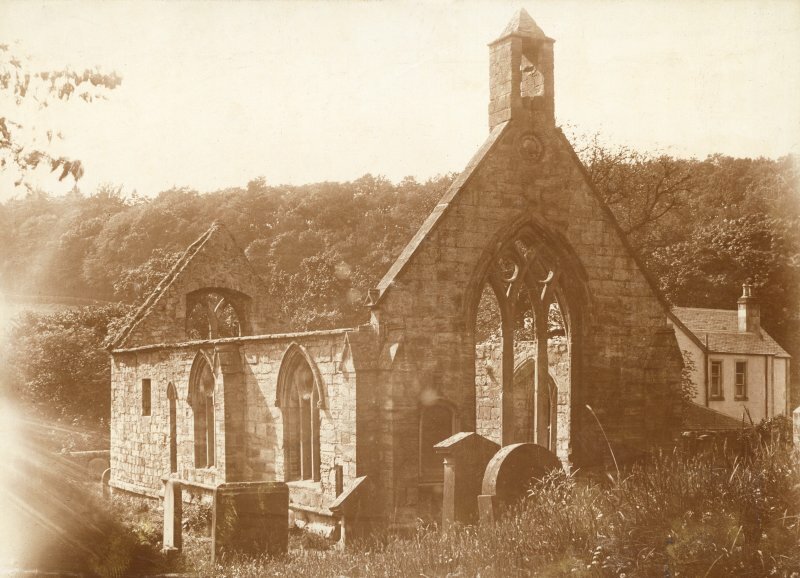 The church (dedicated to the Virgin Mary, as were all Templars' churches) was a single-chambered oblong structure, 54 3/4 ft x 17 3/4 ft internally. The E part, of ashlar, dates from the end of the 13th c, while the W part has been rebuilt. 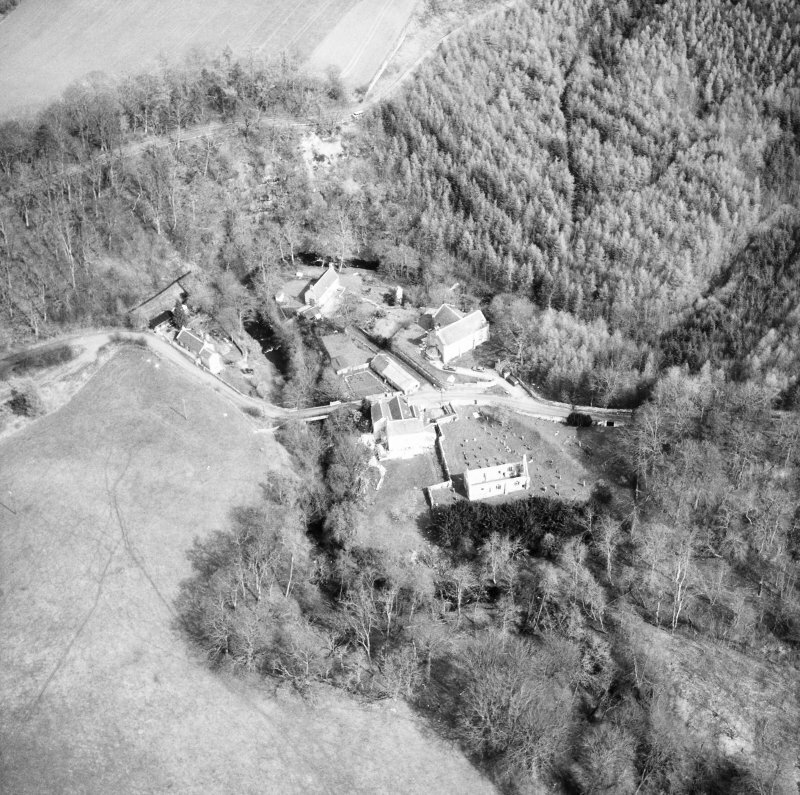 An earlier building probably occupied the site as several courses of 12th c masonry were re-used in the later portion. 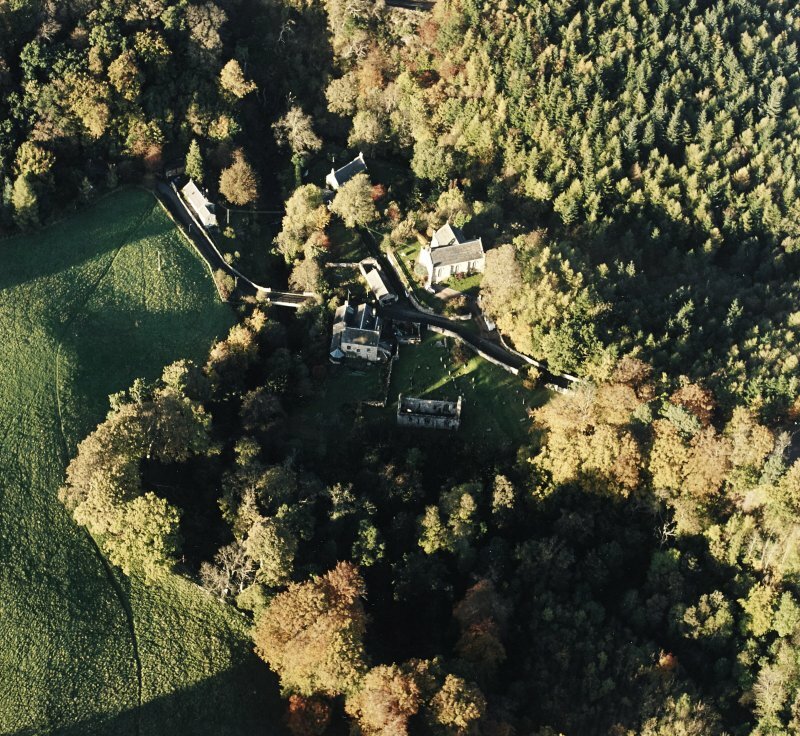 It is roofless, but the walls are complete, and the E gable is topped by a 17th c belfry. 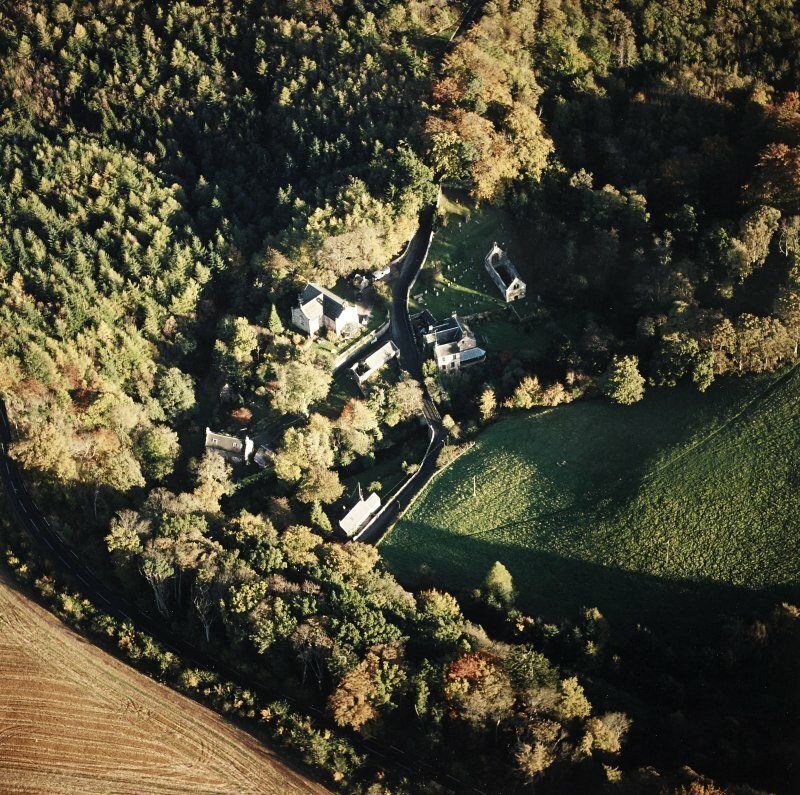 In 1853, the manse was believed to occupy the site of the associated 'Templars' house', and during alterations to it in 1928, a drainage track exposed the basement course of a 13th c building which ran N-S at a distance of 80ft W of the W gable of the church. 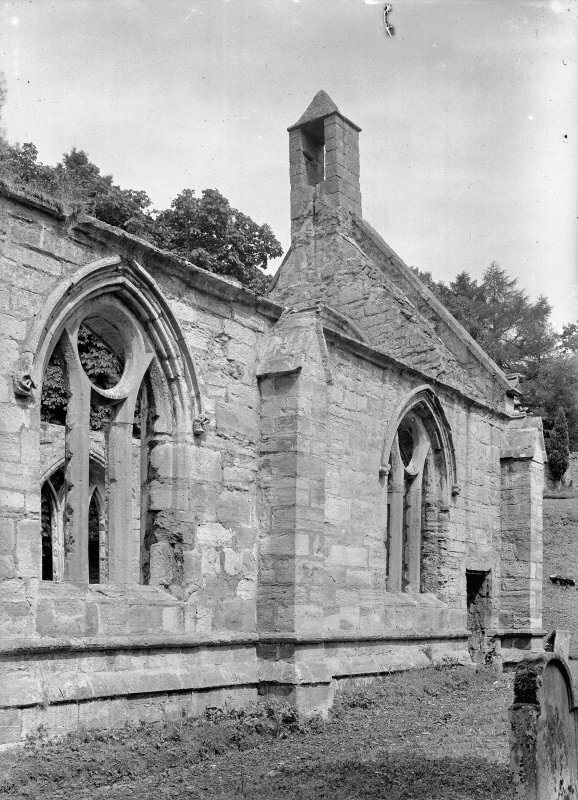 This structure was part of the claustral buildings, the cloister evidently having been on the N side of the church due to the constricted nature of the site. 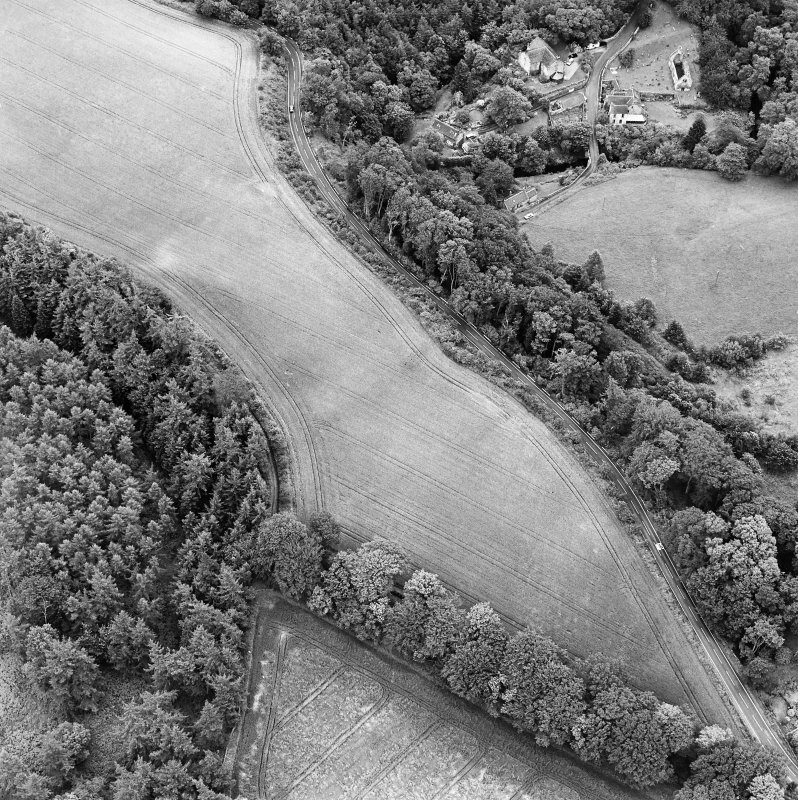 The foundations of a wall and buttress at the bend of the river, S of the manse, may be the remains of the reredorter. A cellar beneath the manse, containing the lower part of a small wheel-stair, may indicate the N range of the cloister. 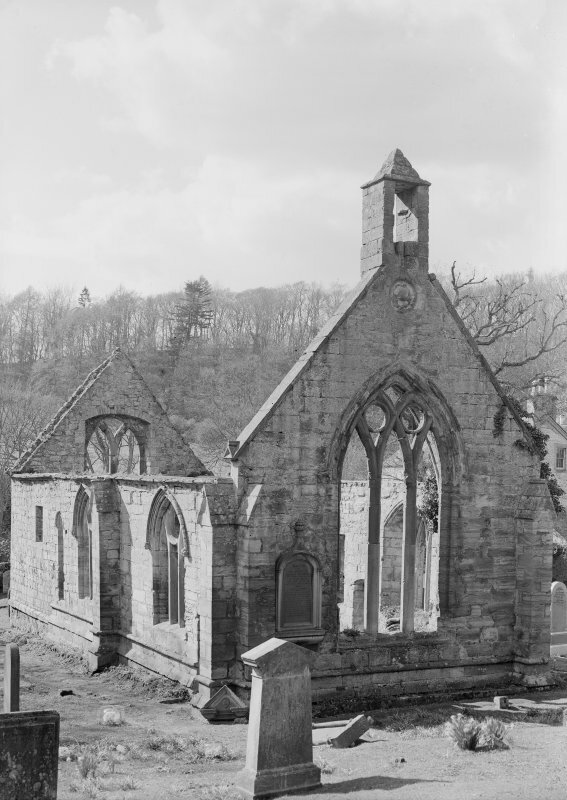 When visited in 1954, the roofless, much restored, remains of the church were as described above. The 13th c E gable was in good condition. 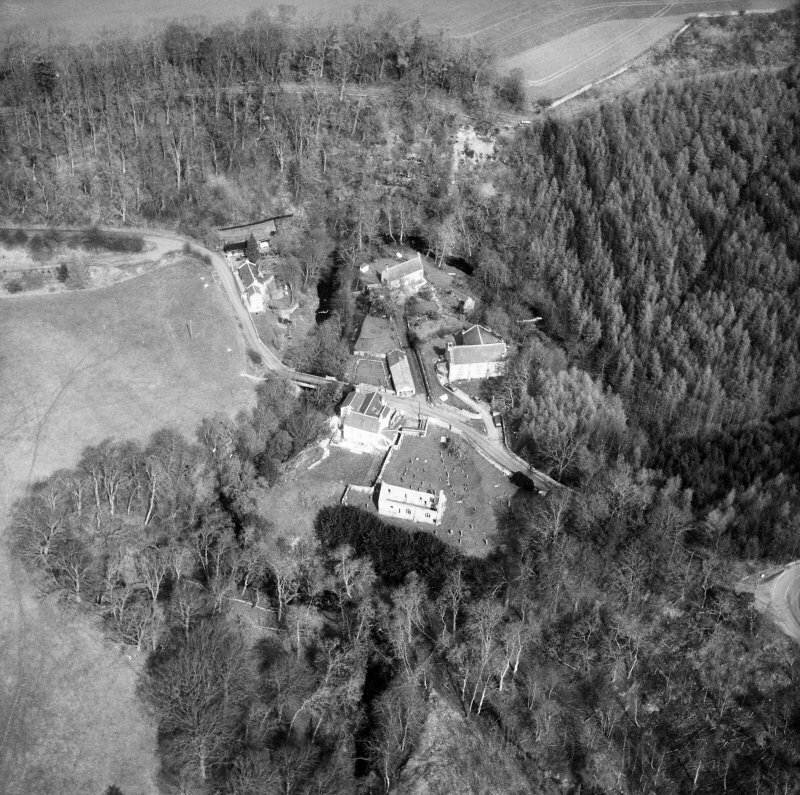 The foundations and buttress mentioned above were not visible. 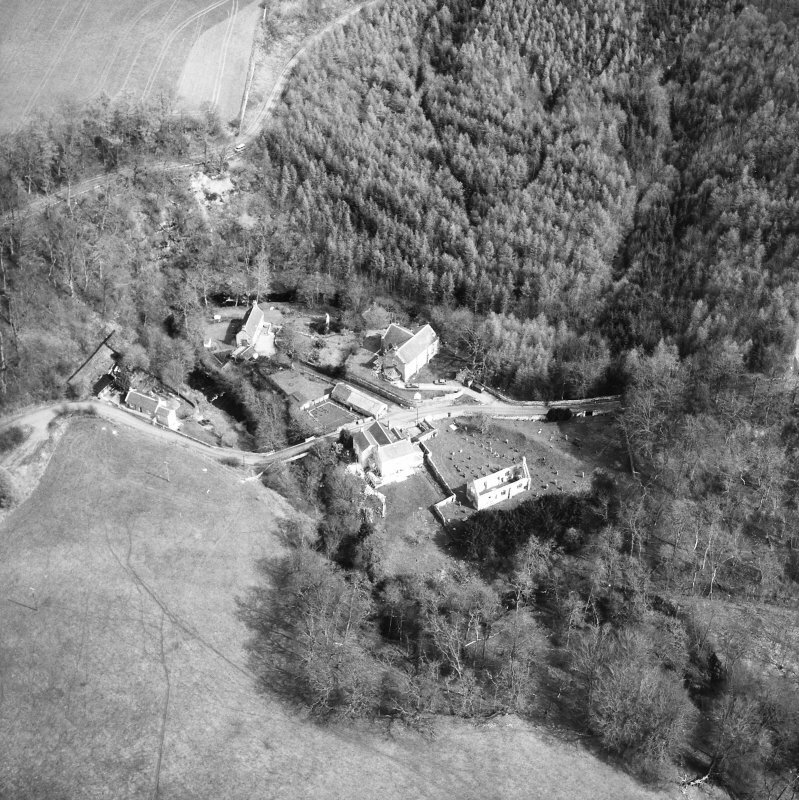 Visited by OS (JFC) 10 September 1954. Non-Guardianship Sites Plan Collection, DC28797. 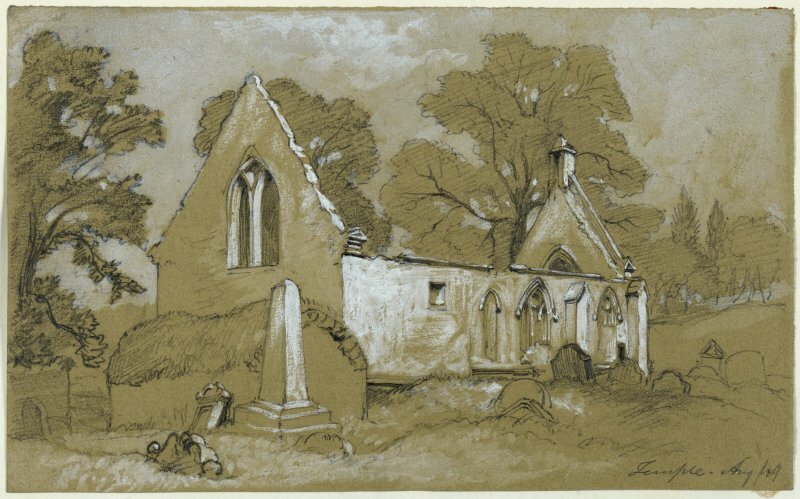 Recording of gravestones in Temple Churchyard by Mrs Betty Willsher in 1986.
wall at Temple, a programme of recording was undertaken in July 2009. 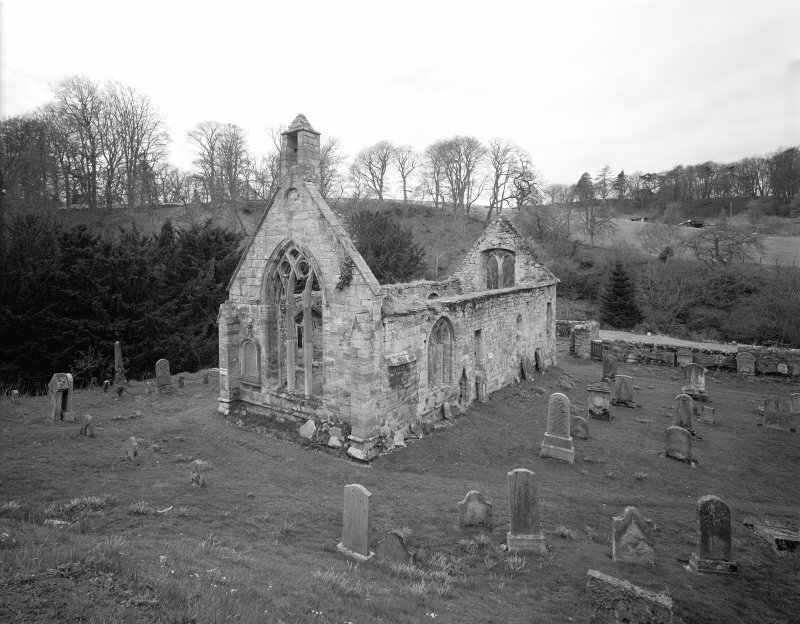 Temple, formerly called Balantrodoch, was the principal seat of the Knights Templar in Scotland. 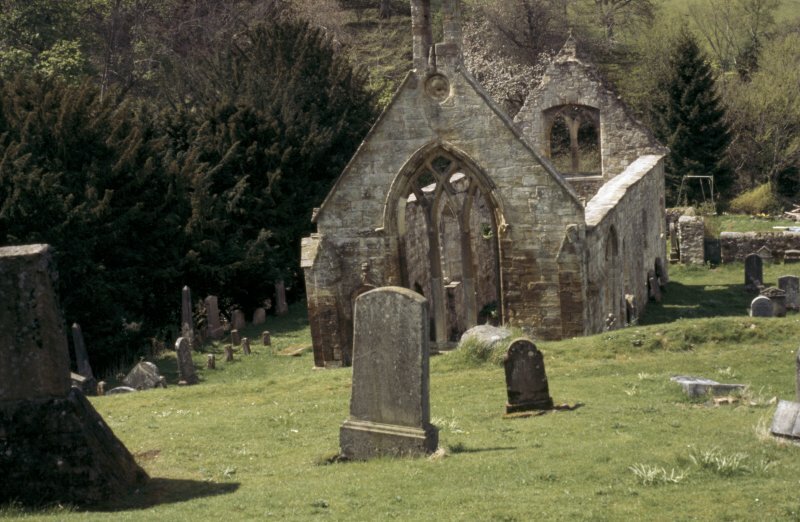 The design of the stones and the association with the Knights Templar suggest a 12th- or 13th-century date. The work involved recording the position of the stones, drawing and photographing them and recording the base and section of the foundation trench excavated for the reconstruction of the wall. 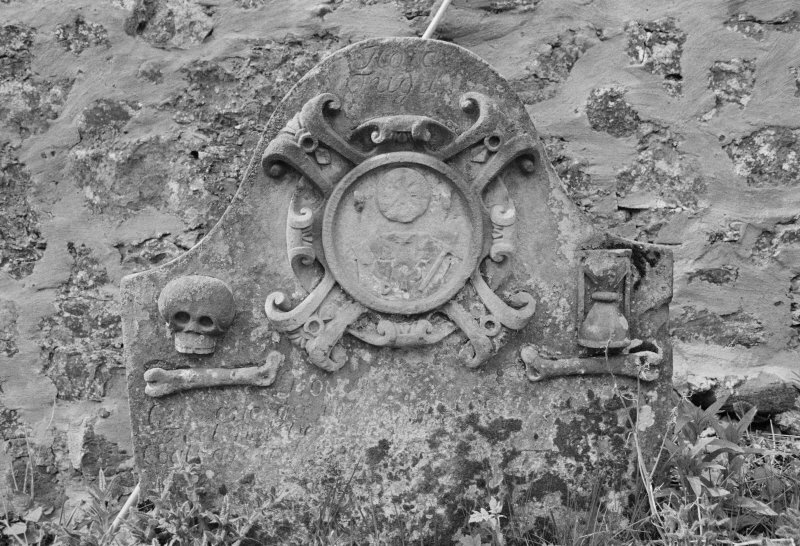 The work also aimed to try and determine if the stone slabs overlay grave cuts. 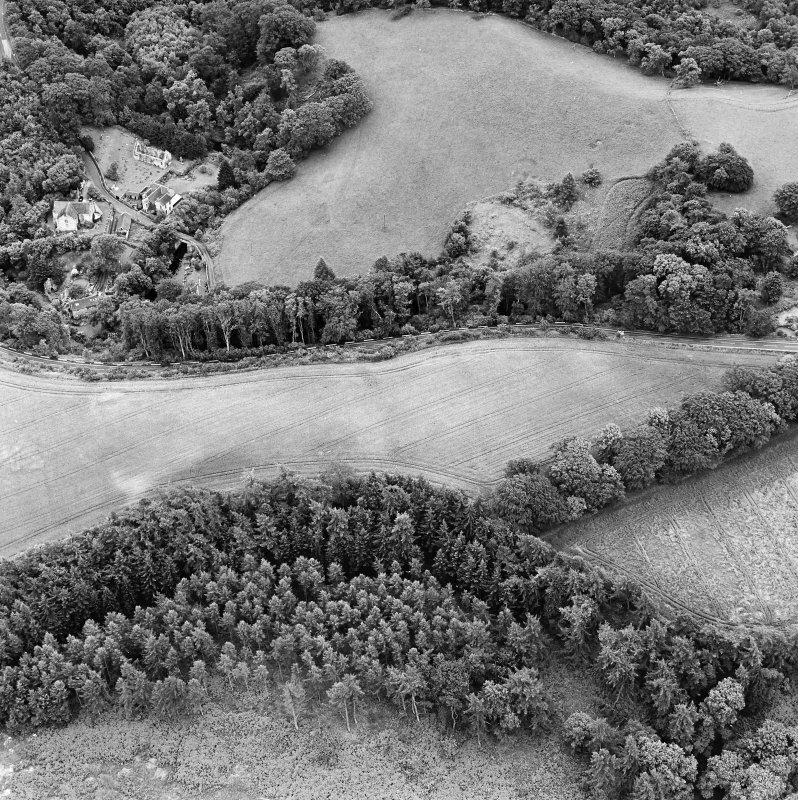 A dip in the level of the subsoil was recorded in the vicinity of the stones, but the evidence for a grave-cut was inconclusive.